This Cruise Ship Watch is a bit unique. Usually I combine all the cruise ships I photographed in a day into one post. Usually I get cruise ships when they're in service and have passengers aboard. Usually I just put up one picture per ship. This is the exception all-around. I present to you, the Spirit of Glacier Bay. Click an image to view full. Spirit of Glacier Bay with the yellow oil containment boom. 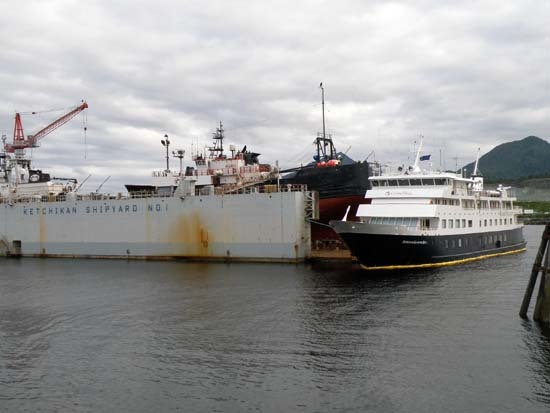 This is the ship I spoke of earlier that ran aground, and it's here in Ketchikan, Alaska for repairs at the shipyard. You can see in the photos, they have a yellow oil containment boom surrounding the ship. 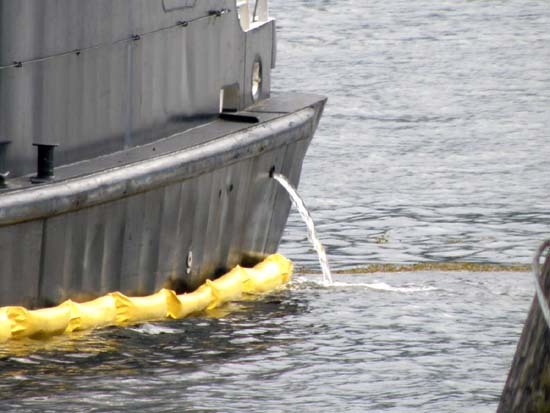 It also must be taking on water still, because you can see that the bilge pumps are running. I had already posted the Cruise Ship Watch for July 14th (today) by the time I took these pictures. I try not to edit posts too much once I publish them. I thought one photo wasn't enough to show everything I wanted to point out. I wasn't sure when the next time would be that this ship would be in town and in service again. Spirit of Glacier Bay, awaiting repairs at the Ketchikan shipyard. Water from the bilge pumps on the Spirit of Glacier Bay. I try not to edit posts too much once I publish them. I don't have that issue, mine change several times. 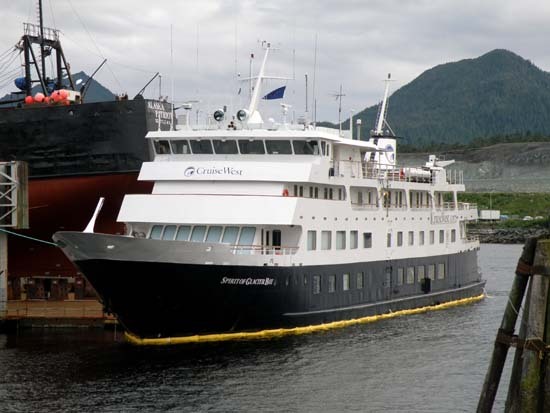 Have you ever been out to sea in one of those cruise ships? A friend of mine takes vacations regularly (her mom is a travel agent) on cruise ships--she loves 'em. I'm a li'l scared of the open sea so I don't think I would. I don't mind ferries but to stay on a ship for a couple days or more--nah, not for me. @ |bernadette|: No, I've never been out to sea on a cruise ship. I wouldn't be scared of the open sea provided I was on a large enough ship.